For those of you pass by a Louis Vuitton store recently, I'm sure you saw those crazy polka dot things in the display windows be it a purse, a wallet, etc.. If you don't know what it is about, it's another Louis Vuitton collaboration with an accomplished artist. This time the artist's name is Yayoi Kusama. Yayoi Kusama is an avant garde artist who worked in several mediums: collage, sculpture, environmental installations, painting, and performance art. She had exhibited with Andy Warhol and Claes Oldenburg in the early 1960s. While Yayoi has been associated with various movements, she's classified as a pop artist like Warhol. She's mostly known as the polka dot artist who obsessively paints lots of polka dot. Her work has been exhibited at MOMA, Tate Modern, and Whitney Museum. 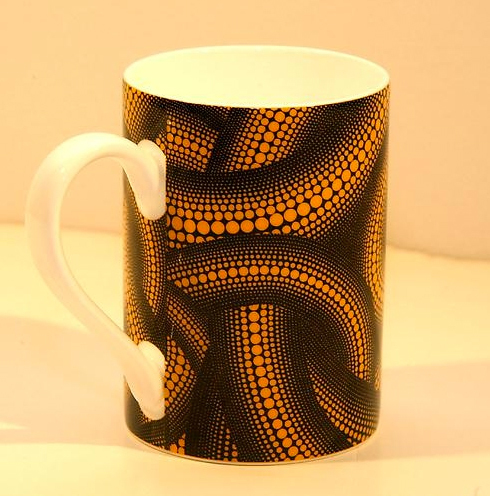 This particular mug is typical of her work... tentacles composed of polka dots! It's a fantastic gift for an art lover who has everything. The mug can be purchased at Gagosian gallery.